He Had One Week To Make A Movie For The Slum Film Festival : Goats and Soda The filmmaker is 21. He had to direct and star in a movie — his first movie, in fact. He was really, really stressed. Would he make the deadline? 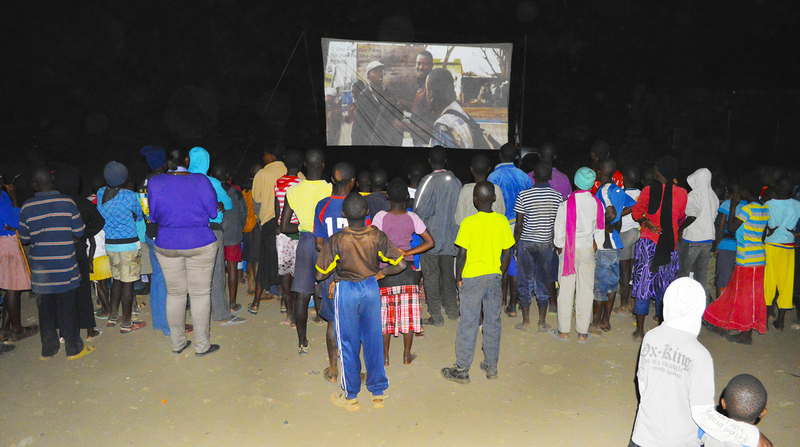 Movie lovers in Nairobi gather for a nighttime screening at last year's Slum Film Festival. 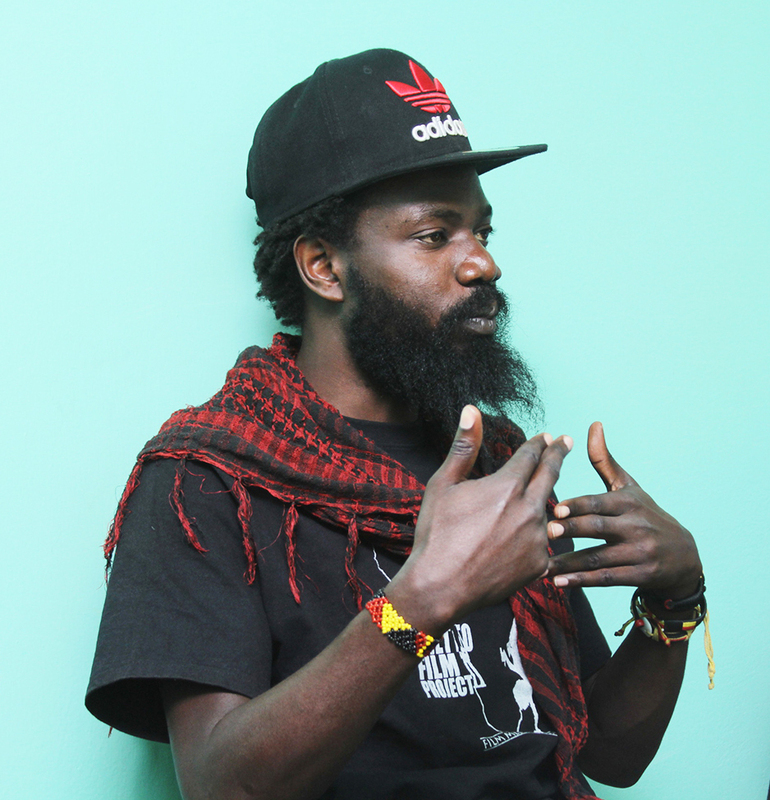 It was the closing ceremony of the Fifth Annual Slum Film Festival and Maxwell Odhiambo's film, the centerpiece of the night, wasn't there yet. "Did you finish it?" his mentor, George Stanley Nsamba, asked nervously as Odhiambo burst through the door, two hours late. "We finished it," he said with a grin. A packed audience in downtown Nairobi, including a Kenyan actor who had flown in from Hollywood, waited for his film to begin. A blue screen stared back at them; the audience shifted nervously. There were technical difficulties. 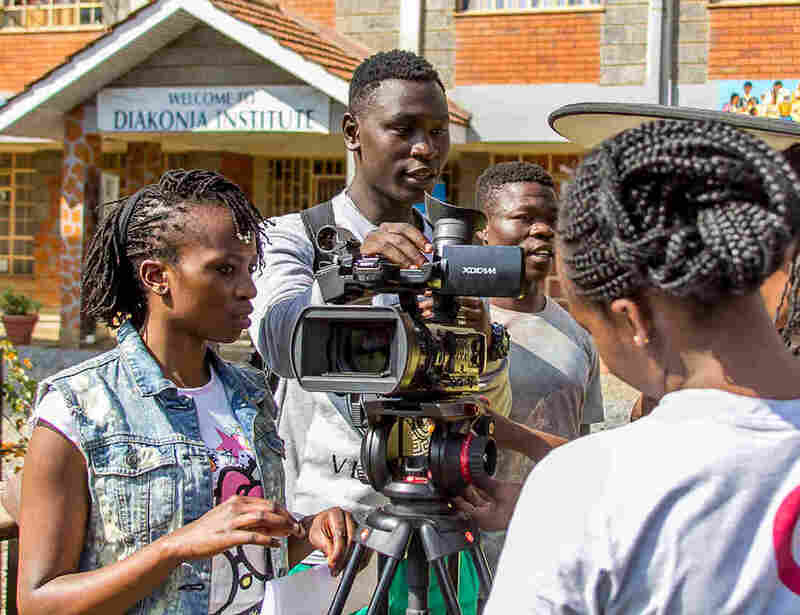 Odhiambo, who is 21, beat out 16 other aspiring filmmakers from slums in Nairobi to make a movie during the festival, which this year screened 45 films about slums or by slum-dwelling filmmakers. He had written it, starred in it and directed it in a week. Now he was afraid no one would see it. "This was my first film — it had to be seen," he said. "I was really, really stressed." He wasn't even sure he could write a script. But Nsamba, who guided him through the process, was confident: "When I looked at him I could see the hunger he had. It was like I had mirror of my younger self." George Stanley Nsamba had a budget of $15 for his latest film. Nsamba grew up in a slum in neighboring Uganda and calls himself a graduate of "The University of YouTube." He's now a full-time filmmaker but doesn't worry a lot about fancy gadgets, because "equipment doesn't make film, it's the art behind the equipment." This year the festival screened his film Silent Depression, which depicts a young generation connected to the world with their smartphones but feeling more isolated than ever. He shot it on a budget of $15. "Max stood out because his script was personal," Nsamba says. "It was his own life." When Odhiambo was 13, his mother died while giving birth to his younger brother. As she was dying, she tried to tell him something but couldn't get the words out. "It pains me that some parents can tell their kids they can go far, that they'll be successful," Odhiambo says, "but my mom couldn't do that." He's struggled to figure out what his mother's words might have been, how they might have guided him as he decides what to do with his life. Back at the auditorium the audience was increasingly restless. "Third time's the charm, right?" said the emcee with cheery determination. After three hours, four laptops to project the movie (one begged from an audience member) and a lot of awkward silence, the film, called Best of Luck, finally played. Shirleen Amisi, the producer of the film, burst into tears of relief. Odhiambo plays a version of himself in the movie: "I'm broke, jobless and can't find my purpose in life." In one scene, a younger sibling looks up at Max's character to tell him how hungry she is — a reference to his attempts in real life to find odd jobs to help feed his younger brother after their mother died. Maxwell Odhiambo (center, holding camera) had one week to make a movie. By the end of the six-minute film, Odhiambo's character finds his purpose when he becomes a journalist and uncovers a crime ring. As the credits rolled, the audience burst into applause. In real life, Odhiambo seems to have found his purpose as well. "Filmmaking isn't just an important tool — it is the best tool to address the issues that are affecting us and relay them to the whole world," he said. "If I can write a script and then shoot and it and then edit it in a week, imagine how many more movies I can make in the future?" And all the technical delays? "Well, that simply means that I'm worth it."